Het Loo Palace (Dutch: Paleis Het Loo, meaning "The Woods Palace") is a palace in Apeldoorn, Netherlands. The symmetrical Dutch Baroque building was designed by Jacob Roman and Johan van Swieten and was built between 1684 and 1686 for stadtholder-king William III and Mary II of England. The garden was designed by Claude Desgotz. The palace was a residence of the House of Orange-Nassau from the 17th century until the death of Queen Wilhelmina in 1962. The building was renovated between 1976 and 1982. Since 1984, the palace is a state museum open for the general public, showing interiors with original furniture, objects and paintings of the House of Orange-Nassau. The "Great Garden" lies privately behind. 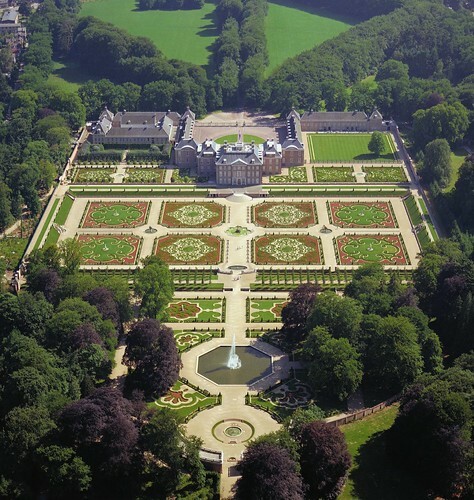 This Dutch Baroque Garden, when miscalled the "Versailles of Holland" serves to show more differences than similarities, still within the Baroque general formula established by André Le Nôtre: perfect symmetry, axial layout with radiating gravel walks, parterres with fountains, basins and statues.